Komoder KM500L Focus Zero Gravity Massage Chair with heating, Gua Sha Reflexology Stretching program, LED lights, and Space Saver technology. A perfect massage chair for your house or apartment. 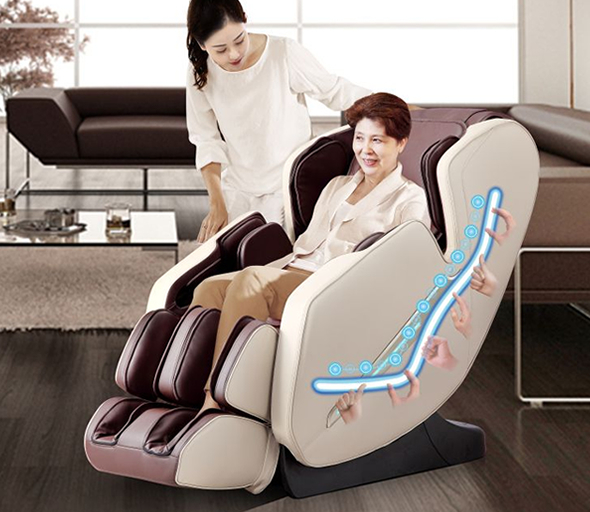 A massage chair that emulates the hands of a massage therapist. The KM500L is a massage chair of the new Komoder generation, equipped with 4 intelligent, silent massage hands that can move up and down for a full back massage. The KM500L uses the new 135-centimeter L-shaped massage track, which makes it the massage chair with the longest massage range. Full air pressure massage (shoulders, back, seat, arms, legs). The KM500L is equipped with an innovative air pump and valve function. The pump can work in sync or continuously, in order to provide the driving force required for the 28 airbags. 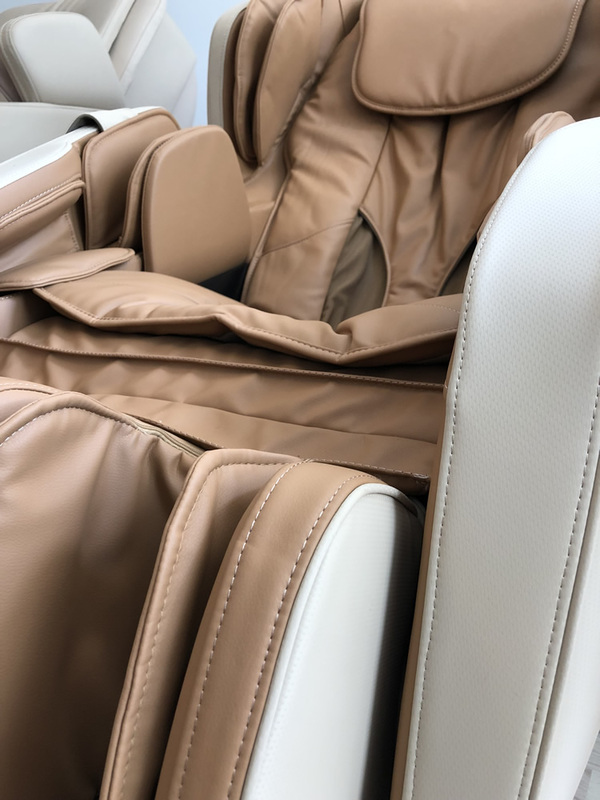 Both the relaxation massage and the strong airbag pressure are accurate and unique, which allows you to enjoy an invigorating massage. 4. Focused programs: Stretching, Comfort, Relax, Full Body, Neck & Shoulders, Back & Waist. 6. Space Saver – can be placed only 5 cm from wall. Equipped with back heating system. The heater enhances the massage effectiveness, eliminating your feeling cold in winter or in air conditioned rooms in summer. With this built-in heating system, the KM500L massage chair has become one of the most complex massage chairs on the market. The back heating function uses carbon fiber as an infrared heating source. The KM500L massage chair takes up less space than other massage chairs. The chair is designed for small spaces so that you only need a distance of 5 centimeters between the chair and the wall behind it, during operation. 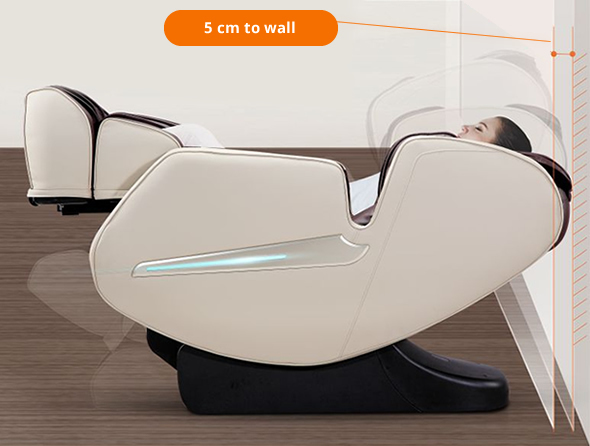 The seat of the massage chair slides forward without touching the back wall. The dynamic shape of this massage chair was adopted in order to allow users to save space at home. This model is ideal for house, apartment, or office, and even for places with limited space. Focused massage programs – very well-designed massage sessions. The massage chair allows access to the programs focusing on different body areas. Focus programs: Stretching, Comfort, Relax, Full Body, Neck & Shoulders, Back & Waist. Select the program according to your needs. Choose Stretch for a morning massage, Comfort when you are having a break at the office, and Relax for moments of relaxation at home, in the evening. Select Neck & Shoulders if you spend a lot of time at your computer. Use the Back & Waist program to relieve muscle tension or to relieve contractions. The chair scans your back and self-adjusts intelligently. The new KM500L is equipped with an automatic shoulder detection system, which means it will scan your back before each massage session in order to detect the user’s height and weight for a perfectly customized massage session. 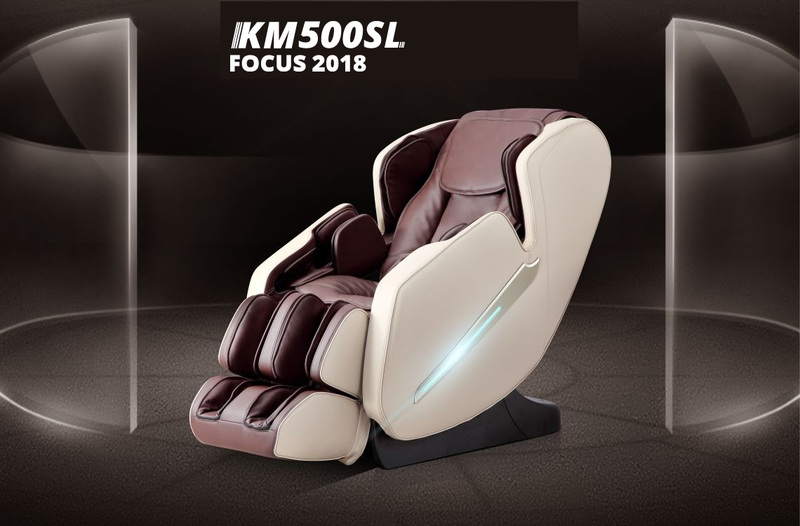 The new KM500 massage chair is equipped with a set of intelligent, silent mechanical hands, which move up and down, in and out, and from side to side. 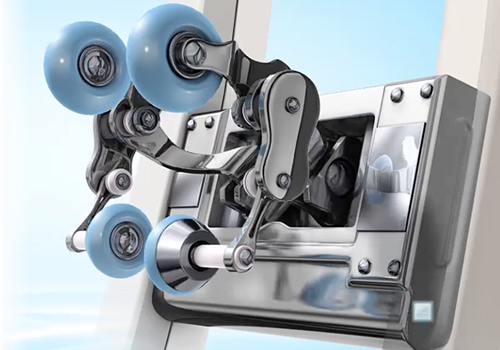 These mechanical hands help detect each user’s weight and height parameters. Adjustable width of back massage roller. 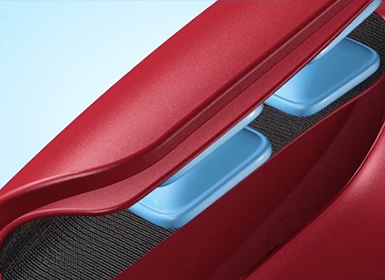 Besides the long L-shaped track, the KM500SL massage chair also allows you to adjust the massage roller width, according to the weight and back width of each individual user. 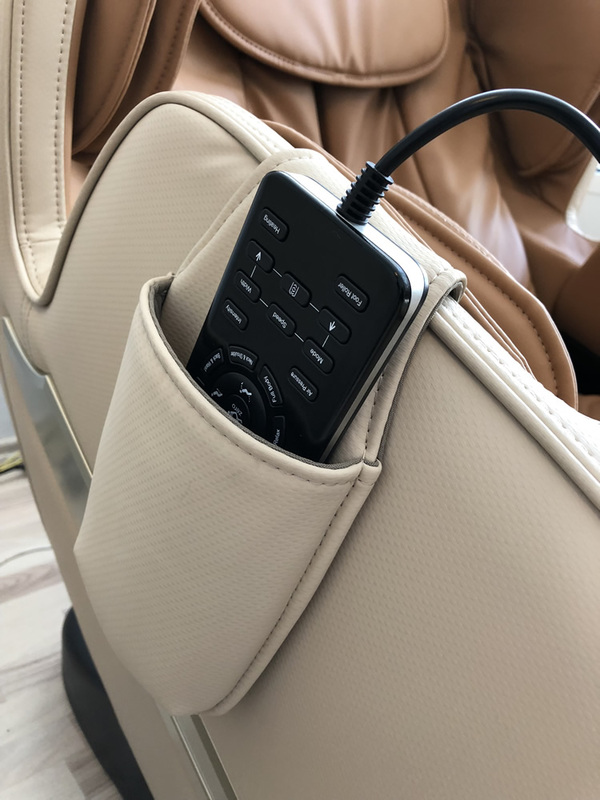 This function can be accessed by pressing the “width” button on the remote control, and it is an important feature for those who want a customized massage. 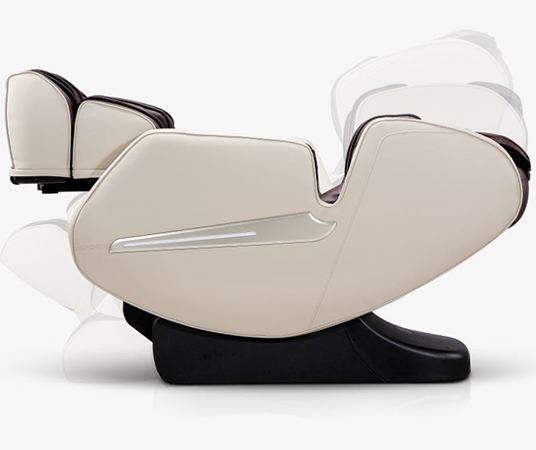 The backrest-seat-legrest synchronization with the aid of the mobile multi-angle module gives you the best Zero Gravity massage experience. Total relaxation and a natural and comfortable massage position are achieved, which improve sleep quality and relieve fatigue. 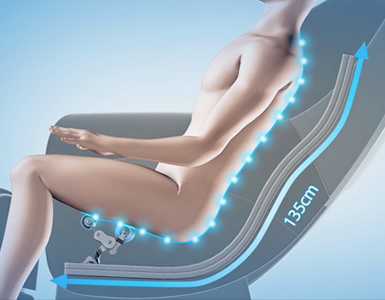 The chair offers a deep arm massage with vertical and horizontal airbags. 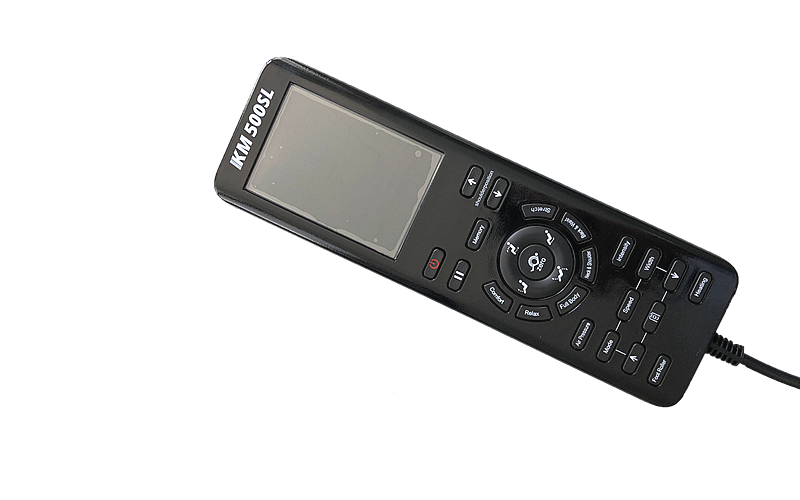 The Komoder KM 500L is endowed with a variety of arm massage improvements. 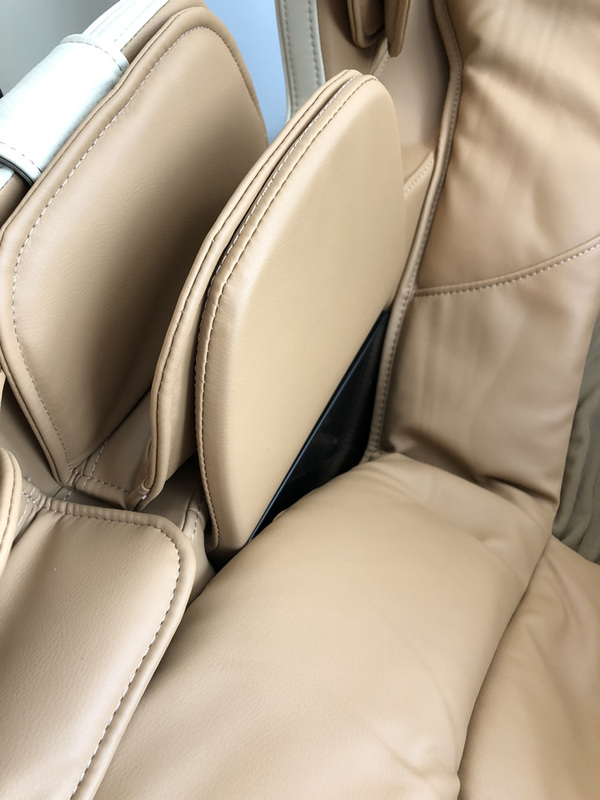 The airbags are positioned differently so that inserting your arms into the arm slots has now become much more comfortable, and the forearm massage is more effective. 4 pressure points for either arm. Compared to other massage chairs, this particular model has more arm massage airbags. Enjoy an air pressure airbag massage. 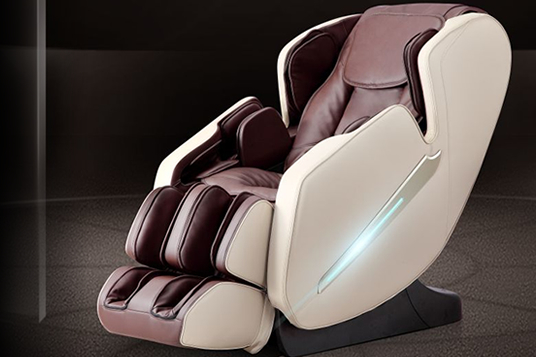 The massage chair fully reclines to offer you relaxation. The new Komoder KM500L can adopt 3 different Zero Gravity positions. The Zero Gravity position will provide you with a state of weightlessness in which you will be able to enjoy perfect, unhindered relaxation. When you start the Zero Gravity mode, the angle between body and feet is approximately 118 degrees. The thighs and calves are raised above chest level. 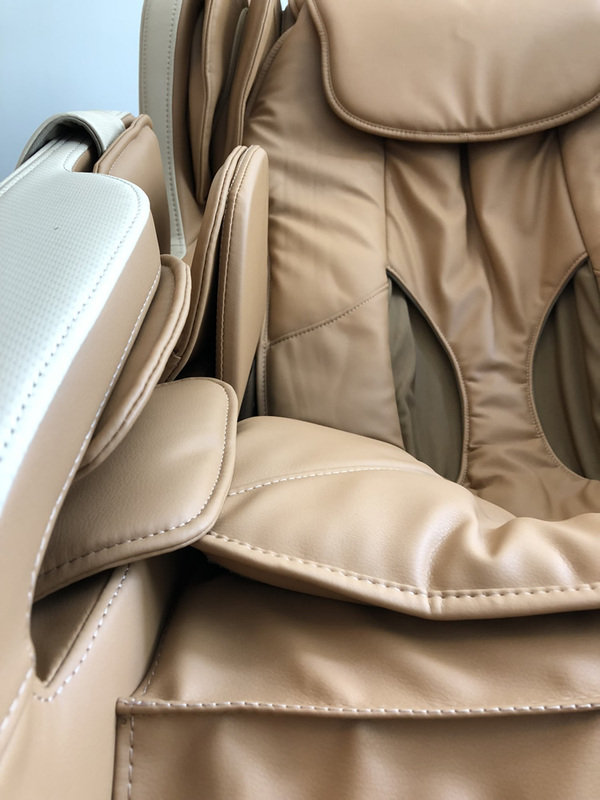 The weight of each body part will be distributed evenly across the massage chair, so that the pressure on the body is completely dispersed. The reflex therapy massage is performed with a small board equipped with rollers, and the footrest extends seamlessly in order to accommodate different user heights. 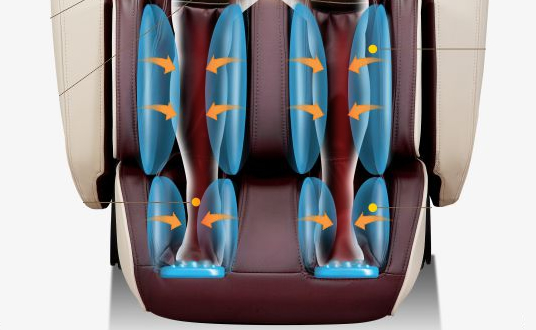 The footrest is equipped with airbags for an air pressure massage, plus 8 natural magnets. 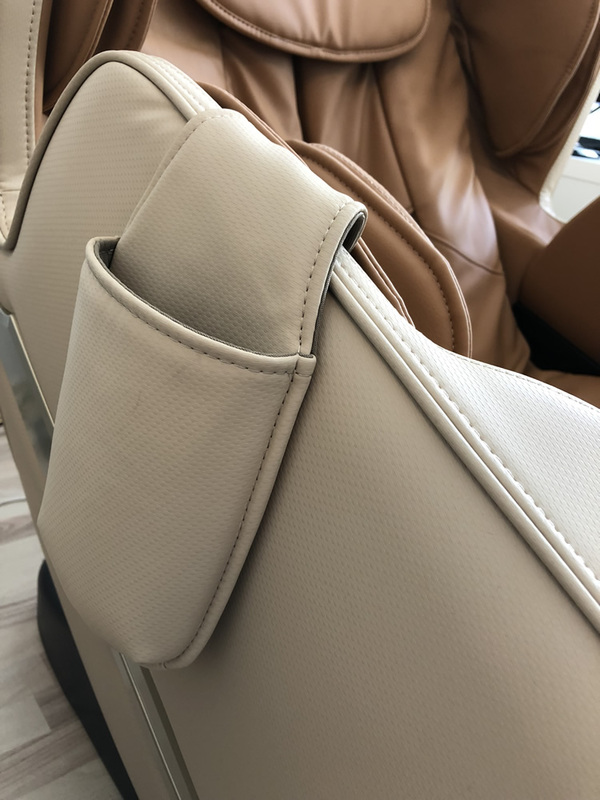 The massage chair is equipped with a special curved L-shape track technology, which is the result of extensive research, complemented by the latest discoveries in this field. 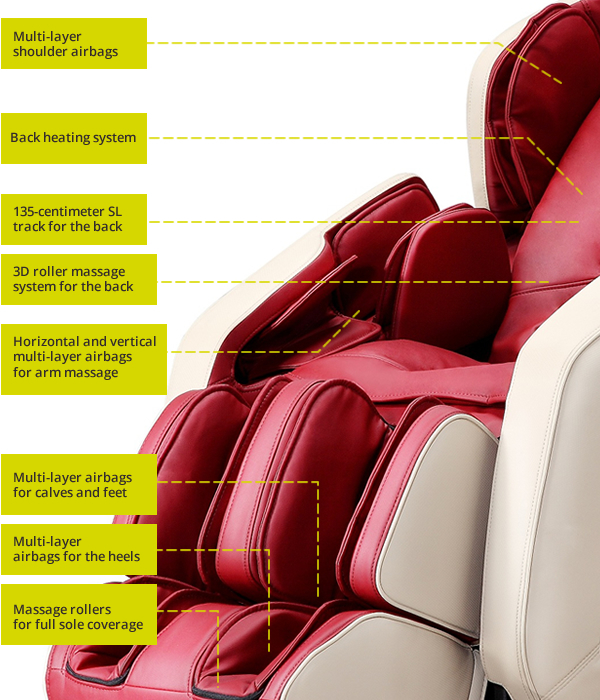 The massage range is 135 cm, which means you can enjoy a custom massage from your head all the way down to your seat, close to your knees. Foot massage. A massage liked by all those who tried it. 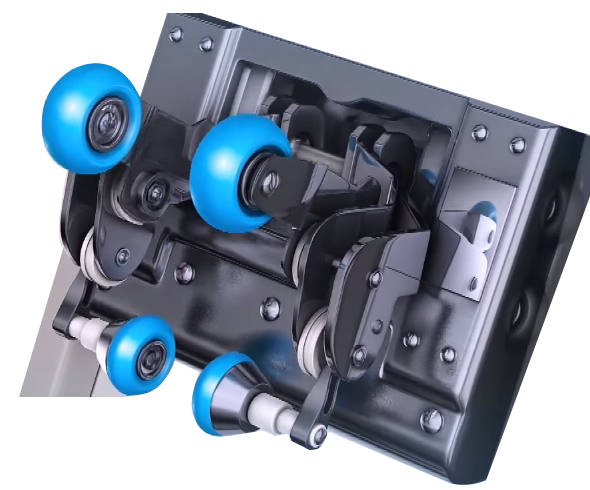 Emulates the touch of a human hand and has an advanced roller technology, offering you a Guasha massage as if performed by a massage therapist. With a 3 cm range and focusing on the Yongquan point on the soles of your feet, the massage provided can be soft and steady, but it can also be stronger, depending on the adjustments you have made using the remote control. Airbags of different shapes wrap around your calves, ankles, and feet, offering you an unforgettable three-fold experience. Activate, in succession, the compression, pause, and air pressure release functions, to stimulate the Xuanzhong and Taixi acupoints, which will provide comfort and perfect harmony. 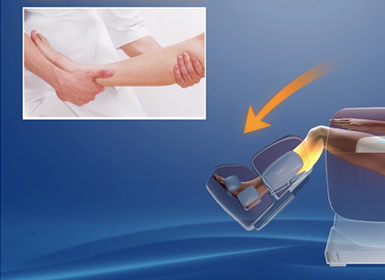 Magnet therapy with the aid of 8 accurately placed 300 cc permanent magnets, can improve the low magnetite level in the human body by stimulating the calf Chengshang and Zhonmai acupoints. The intelligent mechanical massage hands can move up and down the neck, shoulders, back, and waist. 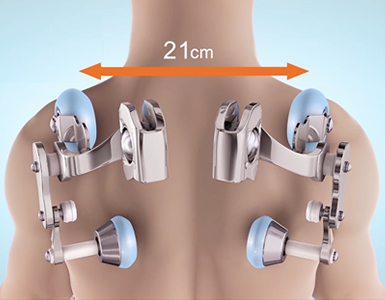 They can automatically follow the curves of the human back, with a range of up to 21 cm in width, the vertical range being 135 cm, which covers the whole back. The S-shaped curve that supports the body requires a combination of the back massage structures and the principles of human engineering, so that you may enjoy a highly-accurate back massage. Width can be adjusted between 6 and 21 cm, with three options. Equipped with 12 airbags which follow the curves of the human arm; provides a full arm massage, activating the Yangchi and Quchi points. 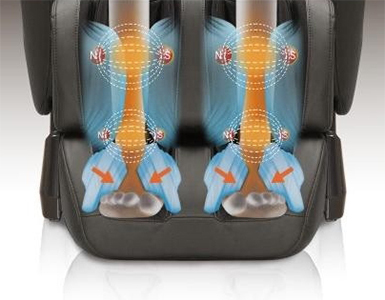 The balanced 3D traction originating in the airbags will relax and invigorate your arms and palms. The back heating function (40º-50º C) eliminates any cold sensation and back pain. The wavelength of the infrared waves coincides with the wavelength of the human body, which allows the energy to be absorbed by the human cells, which activates the cells and stimulates the metabolism. These two functions will meet your family’s requirements. Any massage method and function combination that you and your family may choose can be saved by using the appropriate M1/M2 memory programs. All you have to do is press the button for two seconds after you hear a certain sound, and the automatic memory mode kicks in. With this feature, you can select the massage time of your choice, which allows you to enjoy a continuous massage. Do you have neck or lower back pain? The innovative air pump feature can work in sync or continuously, in order to supply the driving force required by the airbags. 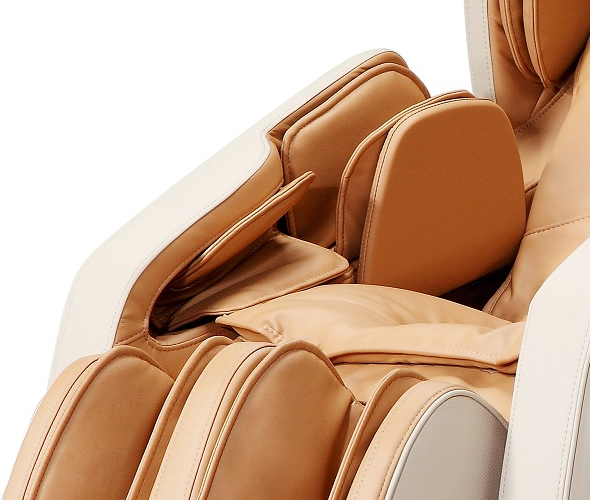 Both the relaxation massage and the airbag pressure are accurate and unique, which allows you to enjoy an invigorating massage. The massage chair knows and takes action! 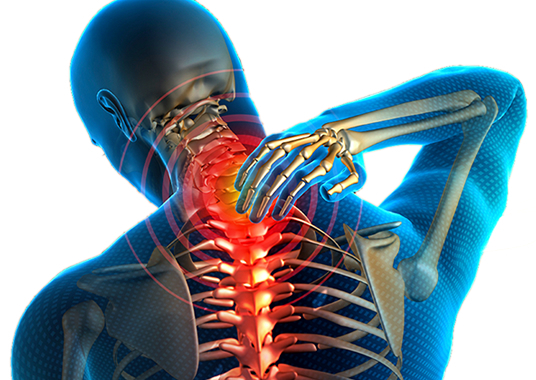 The vertebrae are usually the cause of waist and back ache, as well as of a stiff neck. Komoder massage chairs use a detection technology which can identify the massage points based on your height. From neck to foot, this technology comprises 500 points throughout the body, providing you with a comfortable physical therapy which invigorates you by solving your low health issues. 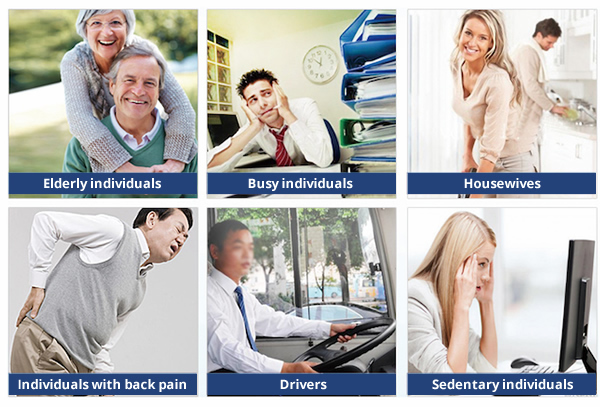 Automatic 15-minute massage program focusing on your fatigue hotspots, offering health care for your entire body. The advanced precision force offered by the roller system in combination with a comfortable air pressure shiatsu massage will chase away the fatigue you acquired as a result of physical workout, giving you a healthy body. This massage will relax your back and waist, by actively acting on your ligaments in the lumbar and thorax areas and relaxing your stiff muscles. Full pressure massage from neck to feet, from your arms to your fingertips; it will offer you an unequalled full-body massage experience. This comfortable automatic neck and shoulders massage mode helps you feel well during the massage, easily relieving any neck vertebrae pain. Designed to relieve muscle pain and stiffness, this program stretches your back muscles in particular, relaxes your muscles in general, and relieves fatigue. 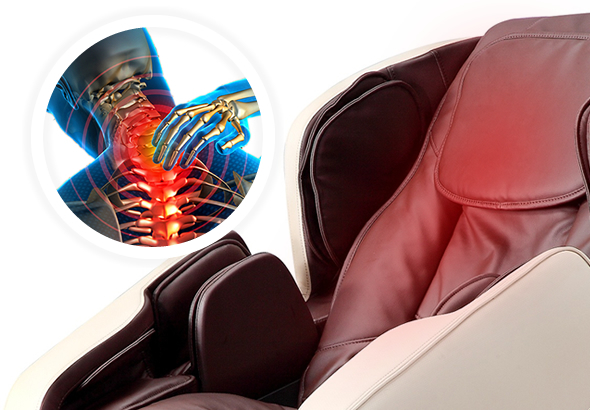 The KM500L – a massage chair like the hands of a massage therapist. 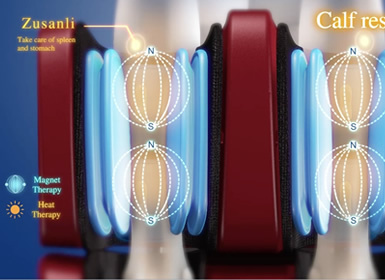 The intelligent mechanical massage hands constantly gather data on the curve of the user’s back in order to offer you a stereo, multidimensional massage. The intelligent massage hands emulate the methods used by massage therapists, in order to perform the following types of massage: kneading, squeezing, flapping, pressing, pushing, grasping, swaying, and twisting. Do you have muscle pain? The massage chair treats contractions. Arm, back, and leg stretching is recommended in order to activate bone regeneration, to relieve muscle tension and contractions. This stretching is performed with the aid of the shoulder, arm, and leg massage cushions. 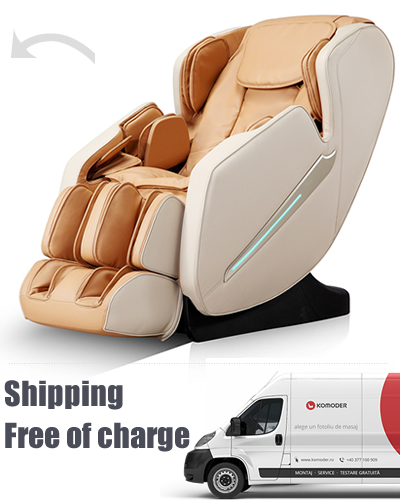 The Komoder KM500L massage chair is designed for different types of users; it comes with innovative auto massage programs, which offer you an individual massage that meets a variety of expectations. 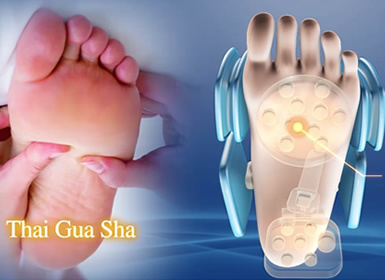 The Gua Sha - Precious Foot Reflexology and airbags stimulate blood circulation in the soles and calves. Depending on the user’s height, the legrest can extend freely, up to a maximum length of 15 cm, which ensures a full-body massage adapted to the size of each individual user. Suffering from lower back or neck pain or exhaustion? Thanks to its new stretching feature, the Komoder KM500 massage chair is the perfect solution for any type of user who is suffering from lower back or neck pain or even insomnia caused by stress or exhaustion. It’s high time you started using a massage chair. Thanks to the body and acupoint detection system and in accordance with the physical features of the body, the KM500 massage chair can detect your neck, shoulders, back, waist, and buttocks, offering a highly accurate fixed-point massage to users of different height. No matter in which of the 6 categories you fall, it’s high time you started using the Komoder KM500SL massage chair at home or at the office. The KM500L is designed with LED lights to create a certain mood. The cool LED lights are located on the armrests and they are visible only when the chair is in operating mode. In a dark room, the LEDs will project a cool, blue light onto the walls, thus creating a relaxed atmosphere.